I am a fan of changing a dog’s behavior through positive reinforcement, and not only using deterrents for anti-barking. So I’ve been digging around for some books on the subject. Nor surprisingly, there aren’t too many books solely focused on controlling excessive dog barking. Rather, you need to sift through regular dog training manuals in order to find the section on barking control. If you’re short on time this could be a problem, so I’ve done the hard work for you. Here are my top 5 books that contain excellent information specifically on controlling excessive barking. 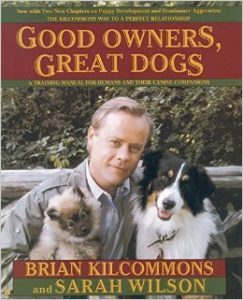 This book is one title in the popular Dogwise Training Manual series. It has received extensive praise and highly positive reviews around the web. 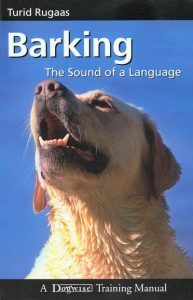 This book sets the basis of knowledge for dog barking. Without understanding why dogs bark, you’ll have a harder time getting them to stop. Rugaas teaches that barking is natural for dogs as it is form of communication – their language. You will discover the 6 different types of barking and how to tell them apart. This is excellent knowledge to have if your dog barks excessively and you need to curb it. Thankfully, also covered are methods to minimize negative barking behavior. Above all, Barking: The Sound of a Language will help you to be calm and understanding, rather than angry and frustrated when your dog barks. I highly recommend this book for ALL dog owners. 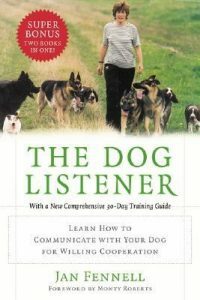 It is one of the few books that has a focus specifically on barking and if that is your main issue with your dog, this is the book to read. This title has an excellent 4+ star rating at Goodreads from well over 400 readers, so I had to take a closer look at this book. I enjoyed the conversational style of writing by Kilcommons, it makes this an easy volume to get through relatively quickly if you wish to read it from front to back (a habit of mine). Of course, you can also just skip to the sections that concern you, such as how to control barking. The tips relating to other behavioral issues are also worth a look in, even if you are not experiencing them right now. Whether you have never been involved in training a dog before, or have some experience, this book will teach you something new. If you’ve ever watched the TV show The Dog Whisperer, you will be familiar with Cesar Millan. You might be a subscriber to his Youtube channel, which contains a ton of content including clips from his shows. I don’t normally go for books written by TV presenters because they are usually nothing more an a franchise cash cow, but I did get the idea that this guy knows what he’s on about, so I wanted to check out his book. The above is so often the case with excessive barking, where dog owners simply have no idea of what is normal dog behavior. they expect dogs to act like people, but obviously this isn’t the right approach to training. This book should steer you back on the right track. I also like his section on “The difference between discipline and punishment”. This is a topic covered in most books, but Cesar has a great of explaining it well and to the point. Make sure you read this part a few times. Pack mentality is the underlying message and focus of this book, and will change the way you think about dog training forever. 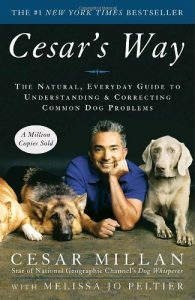 Not surprisingly, this book is a top seller, even though opinion can be divided when it comes to Cesar Millan and his general training methods. You might recognize this author from the TV show “It’s Me or the Dog”. She’s all about positive reinforcement training, and when it comes to excessive barking (and all other issues), that’s certainly what we want to focus on. That’s why I am so outspoken about punishment techniques like shock collars; inflicting pain and fear isn’t how you train a dog. The good thing about this book is how it gives you a broad and basic understanding of the WHY when it comes to dog behavior. How is the world seen from their point of view, and how does that influence their reactions and behavior? Getting an understanding of this can really change the way you approach behavioral management and training, and can go a long way in working with your dog to curb unwanted barking. There are two whole chapters devoted to the broad issue of anxiety and as it relates to various situations. This is a cause of many a problem barking scenarios, and is helpful material to go through. If you’ve been trying to use an anxiety jacket to curb stress related behavior, these chapters provide the theory and practical actions to take to compliment anything you’re currently doing to curb your dog’s anxious behavior. 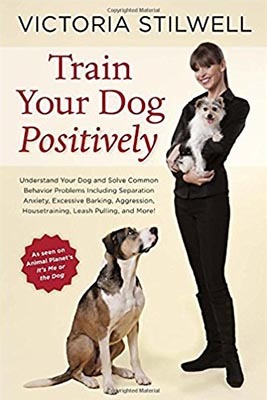 Barking itself isn’t given a huge amount of space in this book, but the common theme throughout of positive reinforcement can be applied to scenarios where excessive barking is a problem; and the final chapter about solving “common” problems specifically includes barking. This is all part of the second part of the book called Behavioral Training Solutions. This book is about relationship building. Based on the principals that if you can understand and build a solid relationship with your dog, then you’ve set the base that you need to deal with any behavior and training issues that you’re confronted with. Small dogs – we know they love to bark. Little breed dogs are some of the biggest culprits when it comes to excessive barking, and when it comes to neighborhood complaints about barking issues. Some call it “small dog syndrome”, but in reality there’s no evidence or statistics pointing to tiny dogs being more problematic with their barking; they just seem to get a lot of attention, perhaps because of the higher pitched yapping that can be hard to ignore. Well this book is not just focused on barking, as you’d expect, but rather on general dog training as it relates specifically to smaller dogs. While most core dog training principals can be broadly applied to all dogs, regardless of size and breed, there are certainly some techniques that can be more beneficial for certain breeds, and for little dogs. And that’s what this book is about. 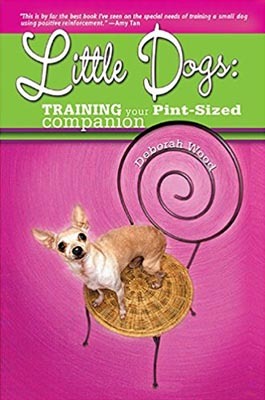 The author has focused on sharing a range of techniques, activities, and even games that are designed with the smallest dogs in mind. Importantly, there’s also coverage of the most widely seen behavioral issues in small canines and how you can deal with them the right way. By focusing on some of the more unique behavior problems that little dog owners see, this book is able to stand out from the more general dog training books out there. Little Dogs: Training Your Pint-Sized Companion might not help you solve every single issue with your small dog, and it’s far from an in depth obedience training manual, but many have found it to be at least a good starting point, especially for those people who have their first little dog and have little experience in training. With high ratings and positive reviews across the web, this book caught my attention. I also enjoyed reading Jan’s book The Seven Ages of Man’s Best Friend back in 2006. Jan is a staunch opponent of using threats and pain in dog training – something that some trainers are unfortunately still using. She doesn’t agree with choke collars, harsh language or smacking either. Like Cesar, Jan focuses on understanding natural wild dog behavior as a basis for being able to train them and to change unwanted behaviors. At 400 pages long there’s a lot of information packed in here, with very little fluff and space filler which can often beset a book of this size. People have had great success following the principles outlined by Fennell in this book. One reader noted at GoodReaders, where this book has a 4/5 star rating currently, that the author “talks about what is really important to dogs and how to be a non-confrontational leader in those situations.” This is really important when it comes to barking, as the tendency can be to become angry and confrontational with your dog, which only makes things worse. I’ve read comments and reviews from beginner dog owners right up to professional trainers who say they have had positive success putting the advice from this book into practice. With a title like “The Only Dog Training Book You Will Ever Need” one has to wonder whether the author is being funny or cocky.. or a bit of both. I wanted to find out by reading it. The sub-title of this book is “From Avoiding Accidents to Banishing Barking, the Basics for Raising a Well-Behaved Dog”. The banishing barking part is what spiked my interest. So many books claim to have barking “cures” but then only touch very lightly on the subject and provide no practical methods for what is often not a simple problem to address. 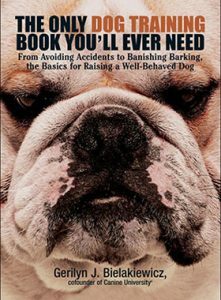 But thankfully this book dives into the barking topic quite in depth, as well as other behavioral topics. It does also go on about clicker training which won’t interest everyone, but there are still principles to be learned about humane and positive training for your dog in general. 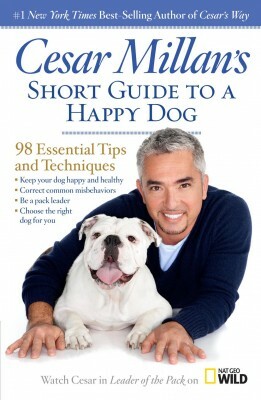 Cesar Millan has his fair share of both fans and critics. Some people just don’t agree with his philosophies and strategies around dog training, especially when it comes to the whole pack mentality and pack leadership form of relationship with dogs. So his training style has been controversial as not everyone agrees with the dominance approach. However this more recent book by Cesar displays a somewhat new approach he has taken towards training. It doesn’t completely do away with the pack theory and leadership, but he does start looking at things from other angles. Did he take on board people’s criticisms and opinions of things in the past that they didn’t like? Perhaps. Or he’s just taken his extremely broad and continuous experience with dogs, where he too is always learning new and better ways of training and relationship building, and that’s where he’s at when this book was written just a few years ago. Cesar has a lot of books out, so if you’ve read a bunch of his other titles then you might not find a whole lot new in this Short Guide. Much of it is a combination of some of the most useful bits from his other books. One of the most useful chapters as it relates to barking problems and anxiety behavior really dives into all of the associated issues we have with dogs who have fear and stress responses like separation anxiety, excessive excitement or unwanted barking. You get to hear about some of the case studies he has personal experience with relating to these issues, and they give a good basis on putting training methods into action. While these training methods can seem relatively simple, they do require you to be very consistent if they’re to work. This is the problem with people not seeing success – no training method is going to work as a once off. It needs to be done continually and with your dedication and patience. If you’ve got that to offer your dog, then the tips, ideas and methods in this book from Cesar are well worth taking on board.